Advises on headphones and speakers to listen to myNoise. From time to time, I'm asked for advise on headphones, or other audio equipment to be used in combination with myNoise. Here are my recommendations... and a couple of Amazon affiliate links, if you ever want to support this webiste through your purchases. To enjoy the myNoise audio quality to its full extend, good sounding headphones are recommended, particularly when you are trying to block audible nuisances around you. Sometimes, wearing headphones is not convenient. Lying in your bed, trying to fall asleep with the help of your favorite sound, is one of these situations. Even if you managed to fall asleep, it is likely that either the cord of your earbuds or the pressure of your head against your headphones' earcups, will wake you up as soon as you are moving in your sleep. People listening to myNoise in bed often rely on external speakers, diffusing the sound in the whole bedroom. This situation is not ideal when you are in a relationship and your partner doesn't agree with your sound selection. To cope with this situation, you can try special headphones, those that are supposedly comfortable to sleep with. Or a pillow that internally hides a speaker. Time to time, people ask me if I could start manufacturing one of either, since the quality of those found online is often disappointing. No, I can't do that, but since, I've been looking for devices I would have been proud to develop in order to answer with a recommendation. Nice sleep headphones, I haven't found yet, but a pillow, I just did. It's bluetooth, it has the comfort and quality that makes justice to the myNoise sounds, and is something I can endorse, though the price is relatively high. We are talking about USD 300 here. 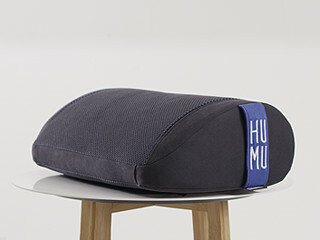 The HUMU is a cushion that connects to an external audio device either by bluetooth, or with an audio cable. As written above, it is comfortable, feels great and sounds nice. It doesn't sound as good as great headphones – it does not even sound like headphones – but offers an extremely nice listening experience: like a speaker but with the proximity of headphones. It offers a strange, unique but satisfying experience I can definitely recommend to people who are into relaxation and stress management. It's like being in a cozy bubble, yet without being disconnected from the external world like headphones do. The HUMU integrates two speakers and offers a fully stereophonic experience. Try binaural recordings (or beats) to relax, they sound amazing on the HUMU. Last but not least, this cushion produces quality vibrations too. Yes, the HUMU vibrates. Vibrations allow you to feel the sound. Any low frequency sound, will produces these vibrations naturally when played at loud levels. But this requires fairly large speakers - subwoofers best - and loud levels to experience. By vibrating, the HUMU recreates that same experience but at much quieter levels. These vibrations create an interesting illusion: lower frequencies are perceived lower and louder than they actually are, as the human brain associates these vibrations with low and loud sounds. What may considered as a gadget, actually helps extending the perceived frequency range towards the low end. When you know that the sensitivity of the human hearing drastically drops in the extremes frequencies as the sound becomes quieter, a speaker that produces physical vibrations makes sense. If I had build that device myself, I would have offered a vibration sensitivity control. I like to listen to the sounds on my HUMU at the quietest levels, and found that when the level is too low, vibrations simply disappear. Furthermore, though the HUMU offers the clearest highs for a cushion, the top frequencies - the last octave of our hearing range - could have been boosted, this again, to compensate for the drop of sensitivity of our ears at quiter levels. Fortunately, this is not much of a concern for myNoise users, since you can always tweak the myNoise sliders to either boost the low end (vibrations) or the higher frequencies. At regular levels, the HUMU sounds fine. myNoise and the HUMU are a fantastic match. I enjoy the HUMU paired with my mobile phone, in bluetooth, while running myNoise for iOS. On the app, I can program a timer, e.g. 30 minutes, and fall alseep knowing that the sound will stop after a while, causing the HUMU to enter its sleep mode too (we both sleep then, yeah). This does save a lot of battery life, and allows to use the HUMU over a whole week without a charge. The HUMU is rated 8 hours of continuous use. The HUMU is available on B8ta (US) and Amazon (UK). Other countries are listed here. Did you ever think how cool it would be to listen to myNoise sounds from a tabletop audio player, one that's small enough to rest on your beside table and soothe you to sleep every night? Well, now you can build your own! It is surprisingly cheap and simple, and the audio quality is excellent, given the size and cost of the hardware. Give it a try! You will need a bluetooth speaker and a cheap microSD memory card. The speaker I tested is the EasyAcc Mini (or the 'igadgitz 2.1' if you are in the EU). The EasyAcc Mini not only serves as a bluetooth speaker, but offers a build-in FM radio and – more interesting for our project – an audio player that can read mp3 files off a microSD card! And there you go: as a myNoise patron, your donation allows you to download a couple of free mp3 audio tracks from your preferred sound generators. The option is located under the 'Current Slider Settings' section of each noise generator. Once you have received your file, transfer it to the microSD card. Power the EasyAcc Mini on, insert the card, et voilà, you're listening to the audio file you've just ordered, continuously playing as a loop! (The playback should start as soon as the memory card is inserted). Total costs of the project: $16 for the EasyAcc Mini, $4 for a cheap microSD card (2GB is plenty) and $5 – of course – to become a myNoise patron and get access to a couple of free audio downloads. Even more enjoyable, if you have the budget... build several of these setups, and assign different sound files to each of them: a water stream, birds, cicadas, for example. Hide the speakers around your living room, and wait for your guests to arrive. A true surround-sound experience that will give your living room a relaxed atmosphere and amaze your friends! Plus, it's a good opportunity to introduce myNoise to them and help me spread the good vibes. I am lucky to be working in a quiet environment: my ideal headphones do not need to block external noises. Rather, I occasionally need to understand someone talking to me, without taking my headphones off my head. Open headphones are the best choice in this case. "Open" means the ear cups will offer almost no attenuation toward external sounds; they'll just pass through. With open headphones, you will hear the sounds around you, just as if you weren't wearing anything. They are more comfortable than closed headphones, they offer a flatter frequency response in general, and they are less fatiguing over long listening sessions. Naturally, you can't ask them to block external sounds efficiently. Still, you can use the masking effect of myNoise to achieve noise blocking, but you will need to set your headphone level higher than with closed headphones. Sennheiser HD-600 • They offer indisputable sound and build quality. They used to be sold for around USD 500, but they're down to around USD 300. That's still a lot of money, but it is a wise investment. Quality headphones will become your best friends over the years – or decades when used with care – unlike the portable electronic equipment they are often connected to. They will also offer you a listening experience that no loudspeaker will ever be able to achieve for the same price. Treat yourself; your ears are worth it! With the HD-600 you will be listening to myNoise exactly as I intended it to sound like. Beyerdynamic DT-990 • They used to sell for around USD 400, but they're now USD 150. That's a deal! They are extremely comfortable and offer a very natural sound. Unfortunately, I tend to break cables easily when moving around my desk, forgetting that I'm wearing headphones. That is the only reason I opted for the HD-600 in the end. If you are a careful person, a fixed cable shouldn't be a problem. The DT-990s are incredible performers, offering an unrivaled level of comfort. At USD 150, it's a no-brainer. Make sure to select the 32 Ohm version if you intend to use them with your mobile phone or tablet. If you work in a loud environment, you will need headphones that block the noises around you. They can be passive, not active. "Passive" means there are no electronics inside the headphones, and the noise blocking is achieved only by the ear cup physically blocking the external sound waves. Active noise reduction works by generating an "anti-noise." It works quite well for quieting constant noises, such as when you are in a plane, but is less effective with transient sounds, like the ones you can hear in an open office. Active headphones are more expensive than passive ones. They require power, and they often fatigue your ear after prolonged use. Though you are not supposed to hear the anti-sound they generate, you still feel some faint acoustic pressure. My advise is simple: passive, closed headphones. They will block a certain amount of noise, and what is left will be masked by listening to myNoise, even at a low level. Closed headphones do seal your ears, which is less comfortable compared to an open design (see above). Opt for closed headphones only if you are in a noisy office. If your office is moderately loud, a semi-closed design is a good compromise. Superlux HD668B • These are surprisingly good for their price! HD668Bs are semi-closed, so they will provide a bit of isolation, and they come with a replaceable cord, which is ideal for me as you already found out. They're an excellent choice if you want to hear how good headphones sound without spending a lot of money. Compared to more expensive headphones, they feel a bit cheap, but they don't sound that way. I recommend them as entry-level headphones, with an incredible performance-to-price ratio. Something like 90% of the sound of professional headphones at 10% of their price. Beyerdynamic Custom STUDIO Headphones • These are my preferred closed headphones because they are surprising light on your head and comfortable, not what closed headphones are usually known for. They come with an ingenious slider that allows you to alter the bass reflex vents in the ear cups. This means you can customize the frequency response in the lower range, in a purely mechanical way: no equalizer required! Plus, if you fully open the vents, they will behave like semi-open headphones. MEE audio M6 PRO • If you are looking for optimal isolation, trying to block external sounds as much as possible, there is a better alternative than active noise-cancelling headphones: Earbuds! Just like earplugs, they will isolate you from the rest of the world in an extremely effective way, by sealing your ear canal. Still, the MEE audio M6 PROs are comfortable, and their sound quality is amazing, on par with studio-grade earbuds. They are not expensive, and they come with a lot of accessories standard, such as different cables (one with a remote), a protective carrying case and ear tips of many sizes and attenuation levels. Highly recommended if you are looking for earbuds. Jabra Move Wireless • I am not in favor of wireless headphones. I prefer them to be passive and cabled so they need no power to run and are always ready when I need them. Plus, the absence of electronics and a built-in battery helps to eliminate planned obsolescence. Now, planned obsolescence is part of many companies' business models, and some smartphones do not even provide a headphone output anymore, forcing you to listen over bluetooth. So if you have no choice, my favorite bluetooth headphones are the Jabra Move. They offer a very nice sound, they're lightweight, and because they are closed, they will help you block noise around you. They are the perfect myNoise companion, if you don't want to hang on a cable. Don't pay attention to the bad reviews about ear cups falling apart after a couple of months. Jabra has updated the manufacturing on these headphones for a long time (and now uses stitches instead of glue for the ear cushions). You can buy with confidence.